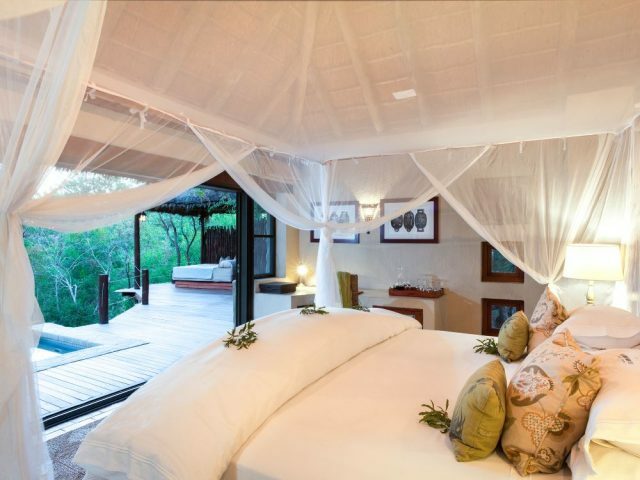 One of our absolute favourite Sabi Sands lodges! Small and intimate; wonderfully stylish yet not over-the-top; outstanding personal service and great game viewing – what’s not to like! The décor is effortlessly classy, successfully blending both contemporary and classic styling elements. There are more cutting edge “designer” lodges out there, but we doubt that you’ll feel more relaxed and “at home” in any of them! Consistent rave reviews from guests for the food and dining experiences – if you manage to leave without gaining at least a couple of pounds around the mid-riff during your stay, we’ll eat our figurative hat! Finding availability at this small and hugely popular lodge can be a real challenge! Dulini sits on a very special spot. 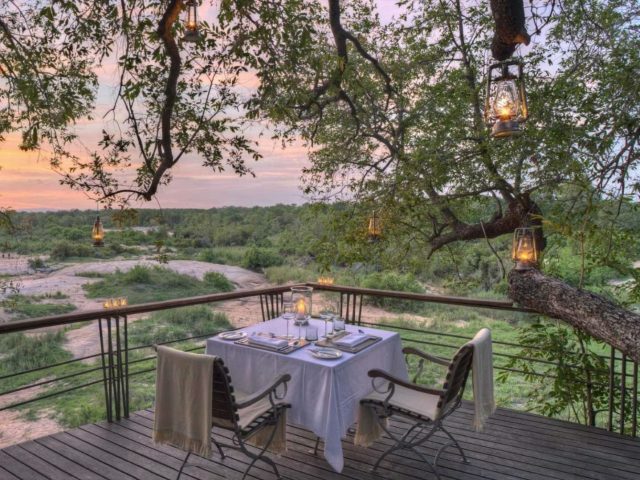 The tranquillity of the riverbed and the intermittent bird calls create the perfect atmosphere for the lodge’s expansive views of the river banks, ancient Leadwood trees and the thick scrub that stretches into the distance – away from the lodge environs their game traversing area of around 10 000 hectares and unfenced border with the greater Kruger National Park allows an enviable richness of biodiversity and fantastic opportunity for game viewing. With just six suites, the lodge never feels crowded, even when fully booked out. The luxury accommodations are cleverly spaced out, to ensure that guests can lose themselves in their own little world in the bush. And what a beautiful world this is: private (heated!) plunge pools gaze out across the riverine splendour of the Mabrak, while wide glass doors and windows fully open out onto your own private wooden deck, blurring the line between ‘in’ and ‘out.’ Polished concrete floors echo the soft khaki and sandy browns of the outside, while thatch, wicker furniture, stone inlay and wooden touches infuse wild elements softened by the addition of soft carpeting and white linen. Falling into the deep comfort of the absolutely massive beds (mosquitos held at bay by wide, soft netting) or taking some ‘me-time’ in the deep, stand-alone tub after a long day in the heat and dust make Dulini an absolute dream. However, it’s the wildlife of Dulini that makes this place even more special. 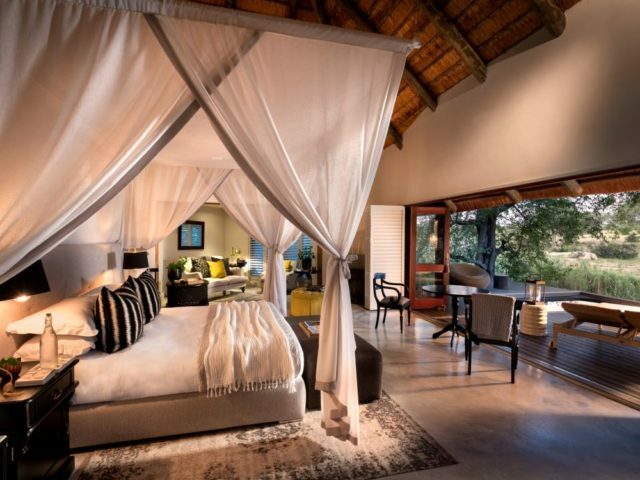 It sits in the 65 000-hectare Sabi Sand Reserve and has an unfenced boundary with the Kruger Park, and so has earned a reputation of being one of the finest game-viewing safari destinations in the country, if not the continent. The diversity and density of wild animals here is just stunning: the Big Five are out in full force, along with hundreds of the smaller beast of the savannah that you never knew were out there. Major draw-cards of Dulini are the chance to see large packs of African Wild Dogs in mid-hunt, prides of lions settling down with their cubs, not to mention the leopards that the Sabi Sands is justly renowned for! These opportunities are maximised by the professionalism and experience of Dulini’s professional and experienced crew whose in-depth knowledge of the reserve deliver truly impressive game drives. But more than that it’s the little things that so often make the difference on a trip like this: the blankets and hot water bottles provided to you on a cold morning, or just a few minutes pointing out some spoor and explaining the mysteries of bush craft. Perhaps most important is the decision to restrict game drive vehicles to just 6 guests – this means that everyone gets a “window seat” with the dreaded middle seat instead left free to stash your cameras or jackets. It makes you feel welcomed and special – and this is a feeling that is magnified a thousand fold when you’re in the thick of the bush with your own personal ranger on a walking safari. We could not recommend this option highly enough: there just isn’t a better way to feel a true immersion in nature. 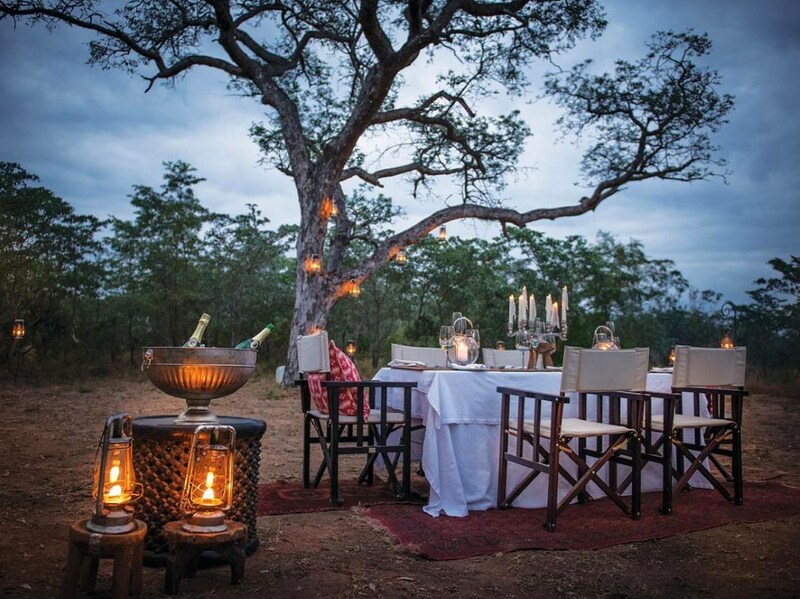 But once the excitement of the bush is over, there is plenty waiting to welcome you back into Dulini’s arms. As the sun goes down, the lodge’s main common area is a cool spot to grab a drink (cocktails if you prefer, although Dulini has an extensively well stocked wine cellar packed with award-winning reds and whites from South Africa’s best estates) and watch the sun sink through the canopy of the Jackleberry tree as you recline on the scattered couches and sun-loungers on the deck. Reliving the day’s adventures in a stunning social space like this is the perfect precursor to a hearty meal in the dining ‘boma’, a wonderfully atmospheric traditional fenced area complete with candles and a roaring fire; but if you’re feeling more introverted than chatty, it can be really nice to grab a nice book from the lodge’s library (they have plenty to choose from – especially if you’re looking to learn more about the area and its flora and fauna) and hide away in a cosy corner somewhere. And that’s what is so great about Dulini: you set your own pace, and things just kind of fall into place around you. Whether you crave the excitement of daily adventure and roaring around the park, or catching a quiet afternoon with your significant other, you never feel like you’re in the wrong place at the wrong time. At Dulini, there’s something for everyone. 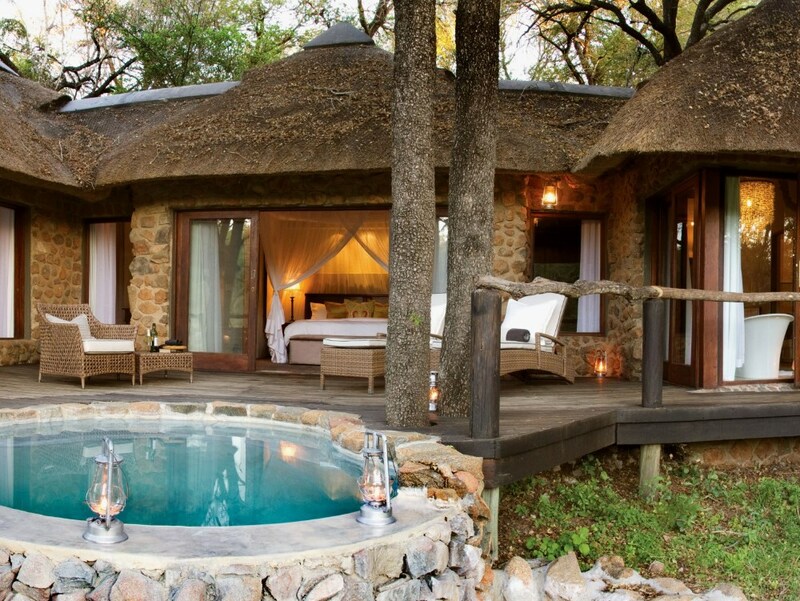 When you’re not on the trail of big cats, your lovely deck with private plunge pools and relaxing sala is the perfect spot to while away the hours!